Advanced members competed in the TMEA All-Region Band Auditions in College Station on Saturday. I am happy to report that 33 of our students earned a spot from the 48 students that we brought, which is nearly a 70% acceptance rate. This breaks our previous record of 30 from last year. A total of 8 middle schools participated from Belton, Bryan, and College Station, and I am very proud that we earned the most spots from any school! In the flute section, Aiden V. ranked 9th out of 45 students, which placed her 3rd Chair in the Concert Band. Janiely B. ranked 11th and placed 5th Chair in the Concert Band. Honorable mention goes to Leilah M. for ranking 15th, which places her as the 2nd Alternate. In the oboe section, Malia R. ranked 1st out of 9 students, which places her 1st Chair in the Symphonic Band. She is a 2-Year All-Region member. Honorable mention goes to Teagan R. who ranked 6th, which places him as the 2nd Alternate. In the bassoon section, Gage C. ranked 2nd out of 8 students, which places him 2nd Chair in the Symphonic Band. In our awesome clarinet section, Mya V. ranked 2nd out out of 51 students, which placed her 2nd Chair in the Symphonic Band. She is a 2-Year All-Region member. Ashley H. ranked 10th and placed 10th Chair in the Symphonic Band. She is also a 2-Year All-Region member. Caitlyn S. ranked 12th and placed 2nd Chair in the Concert Band. Amanda D. ranked 13th and placed 3rd Chair in the Concert Band. Chloe M. ranked 22nd and placed 12th Chair in the Concert Band. In the alto saxophone section, Kason W. ranked 7th out of 28 students, which placed him 3rd Chair in the Concert Band. Honorable mention goes to Brandon B. who ranked 11th, which places him as the 2nd Alternate. Ashu G. ranked 3rd out of 8 tenor saxophone students, which placed him 2nd Chair in the Concert Band. In our solid trumpet section, Clayton O. ranked 1st out of 47 students, which placed him 1st Chair in the Symphonic Band. He is a 2-Year All-Region member. Hailey L. ranked 3rd and placed 3rd Chair in the Symphonic Band. Colby F. ranked 4th and placed 4th Chair in the Symphonic Band. Aiden O. ranked 13th and placed 5th Chair in the Concert Band. Aidan S. ranked 14th and placed 5th Chair in the Concert Band. Bryce R. ranked 18th and placed 10th Chair in the Concert Band. In the horn section, Emily L. ranked 6th out of 33 students, which placed her 6th Chair in the Symphonic Band. Timothy M. ranked 8th and placed 2nd Chair in the Concert Band. John G. ranked 10th and placed 4th Chair in the Concert Band. Giani Z. ranked 13th and placed 7th Chair in the Concert Band. In the trombone section, Duncan L. ranked 12th out of 39 students, which placed him 6th Chair in the Concert Band. He is 2-Year All-Region member. In the euphonium section, Kole P. ranked 1st out of 24 students, which placed him 1st Chair in the Symphonic Band. He is a 2-Year All-Region member. Druw B. ranked 3rd and placed 1st Chair in the Concert Band. He is also a 2-Year All-Region member. In the tuba section, Chris S. ranked 1st out of 23 students, which placed him 1st Chair in the Symphonic Band. He is a 2-Year All-Region member. Damien S. ranked 2nd and placed 2nd Chair in the Symphonic Band. He is also a 2-Year All-Region member. Katarina C. ranked 3rd and placed 3rd Chair in the Symphonic Band. Cole V. ranked 9th and placed 5th Chair in the Concert Band. In our rockin’ percussion section, Sam F. ranked 2nd out of 39 students, which placed him 2nd Chair in the Symphonic Band. He is a 2-Year All-Region member. Grant S. ranked 3rd and placed 3rd Chair in the Symphonic Band. He is also a 2-Year All-Region member. Grayson N. ranked 5th and placed 5th Chair in the Symphonic Band. Nolan K. ranked 10th and placed 3rd Chair in the Concert Band. Kaydence D. ranked 14th and placed 7th Chair in the Concert Band. 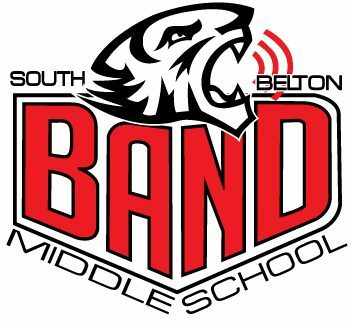 Thank you for your support of the South Belton Band!